This Sunday we continue our sermon series based on the Adam Hamilton book Half Truths. Learn more about the full series here. 13No temptation has seized you that isn’t common for people. But God is faithful. 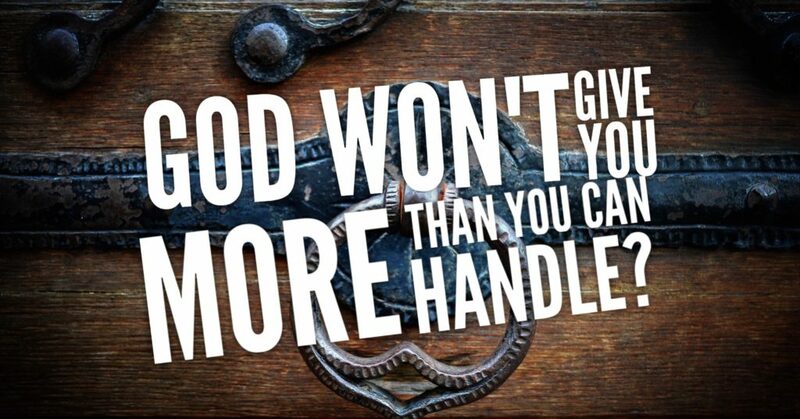 He won’t allow you to be tempted beyond your abilities. Instead, with the temptation, God will also supply a way out so that you will be able to endure it. As with each of these half truths, its important to notice what the bible says and what it doesn’t say. To be sure, there is a message of faith embedded in Paul’s words. But it is up to us to unearth it such that it can become a positive affirmation for our brothers and sisters in Christ. This half truth contains the phrase “God gives…” Do you believe that God gives people painful and difficult experiences? If God didn’t cause them, how do you account for them? In this passage, Paul’s message to the Corinthian church revolves around facing temptations. What types of temptations are challenging for you to face (i.e. I have a hard time saying no to people, even when I’m already overworked!)? Paul’s message doesn’t say that bad things will not happen to the members of the church. What do the words of scripture affirm instead? Audio from the sermon can be heard below, and video can be found by clicking this link (will open in a new tab). This past Sunday, Dr. Carter explored the full context of Paul’s first letter to the church in Corinth with a parallel of his own life and the assurance that God does not leave us alone in the time of trial. It is not that God doles out those events that challenge us, but that in the midst of life’s most difficult circumstances God remains with us and abides in us. 1 Corinthians 10:11-14 – In the fuller context of verse 13, we see that Paul was speaking about a specific issue and not making a broad statement about our ability to “handle” everything that comes our way. James 1:13-17 – James teaches that good gifts come from God and that temptation and evil do not. Numbers 11:10-17 – In Moses’ despair over the complaining of the (newly rescued) Israelites, God both assures Moses that he is not alone and calls the people to offer support. Jeremiah 20:7-9, 14-18 – As a prophet, Jeremiah spoke God’s message and was reviled by God’s people. In this text, Jeremiah is both honest and raw in the way he speaks to God about the experience. 2 Corinthians 12:7-10 – In the same letter from which the half-truth discussed in this sermon comes, Paul vulnerably shares his awareness of his weaknesses and his faith that Christ’s power is his strength. Romans 8:35-39 – Moses, Paul, and Jeremiah all share in the struggles that they have faced; and we may be reminded that we are not the only ones who struggle. Even in the face of this, Paul’s writing offers assurance to us all that strength is made available to us; life is given to us; and love cannot be withheld. What pressures or circumstances in the world might cause us to lose faith? If not lose faith, what might cause us to hide our faith? What might we do to work against this loss or hiding of faith? Moses and Jeremiah (and to a certain extent, Paul) faced unpopularity among the people they were trying to serve. When you face challenges in your own faith, do you communicate with God in some fashion about this? Is it sometimes blunt? How do you experience God’s response? Paul writes that nothing can separate us from the love of Jesus Christ. What kind of circumstances bring a sense of being overwhelmed? Do any of them tend to make you feel like you are separated from God? What can we do to both keep and even build our faith and confidence that God is with us when we face life’s greatest challenges?